Graduate employees gather at Old Main on Wednesday to support The Coalition for Graduate Employees' decision to unionize. Graduate employee Nathaniel Porter held a sign in support of the Penn State Coalition of Graduate Employees on Wednesday. 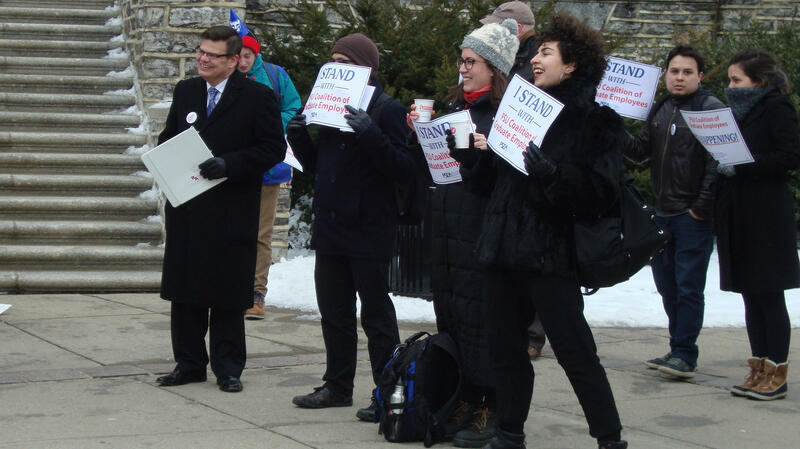 Graduate student employees, faculty members and members of the Pennsylvania State Education Association attended Wednesday's rally in favor of a graduate employee union. Graduate employees like Irene Arellano say they just want a voice when it comes to issues that affect them. “Students are asking for recognition and negotiations on issues including pay, benefits, mental health services, racial and gender equity among faculty and students,” Arellano said. University spokesperson Lisa Powers said in an email that the university recognizes the many challenges students face and hopes to continue to interact directly with the student employees without a third party.